Level 22 [$1.99] offers up a plot not often found in the world of gaming. Gary is late for work, and it's your job to get him all the way back to his desk without anyone noticing him. The problem is he works on the 22nd floor for a giant company, and there are co-workers, guards, and managers at every turn. It's a Metal Gear tribute in a lot of ways, from the art style down to the core gameplay. The entire setup is videogame-esque, and it works very well. As Gary reaches each new floor (framed as "levels" and "worlds") you'll have to pick up new concepts and face new foes along the way. If there's one thing I like in a mobile game it's variety, and Level 22 has it in spades. To control literally everything Gary does, you simply tap where you want to move, and tap to interact with objects. In some missions you'll have an equippable item in the corner of your screen, like a newspaper to hide behind, and it thankfully doesn't block anything. You can flick around the screen to view your surroundings, but sadly there is no zoom option, which makes some levels a little frustrating, as it would be ideal to be able to plan your escape. I love the pixel art design and the chiptune soundtrack, as they mesh together very well, and give it that retro veneer that the old MSX Metal Gear games had down to the top-down viewpoint. There's more Metal Gear references than that, as cell phone conversations with your Otacon-like friend mirror codec calls, donuts to lay as traps in lieu of "girlie mags," and even a cardboard box comes into play. The difference here is that if anyone spots you, the game is automatically over and you'll return to the latest checkpoint -- usually very close by. While I would normally feel a sense of dread when failing a stealth mission due to getting caught right as I was turning a corner, the frequent checkpoints ensure that you'll want to jump right back into the action. An instant restart button also helps if the level isn't going quite how you want it to, or a co-worker is lingering a little too often in a certain spot. Sometimes, the visual cues are a bit lacking in the sense that it's really hard to figure out where to go or what to do at points, but I never found the game to be completely unfair. So long as you keep an open mind for the puzzle at hand and try to think out of the box (look up at the vents often), you should be able to complete the game without any major issues. For all the completionists out there, Level 22 does have secret items to collect and secret rooms to find, but the game doesn't really compel you to find any of them, and they're not all that exciting to seek out. 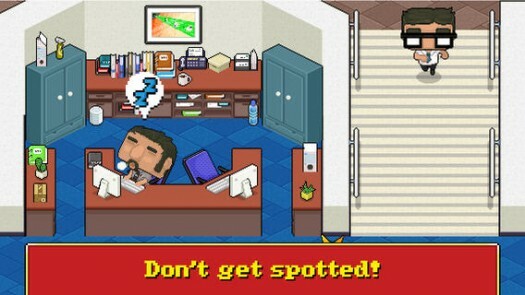 Level 22 is a delightful re-creation of some of the best parts of the retro stealth action games. It's mostly a "one and done" affair as there is little reason to return after you've completed it, but odds are you'll spend an entire afternoon playing through it.